Europe’s first ever pop-up Shakespearean Theatre – SHAKESPEARE’S ROSE THEATRE - has been given its final official green light by the City of York Council’s planning department and has officially launched in York, promising a unique summer of Shakespeare. Tickets for the inaugural season of four of Shakespeare’s greatest works are on sale through Ticketmaster and York Theatre Royal. 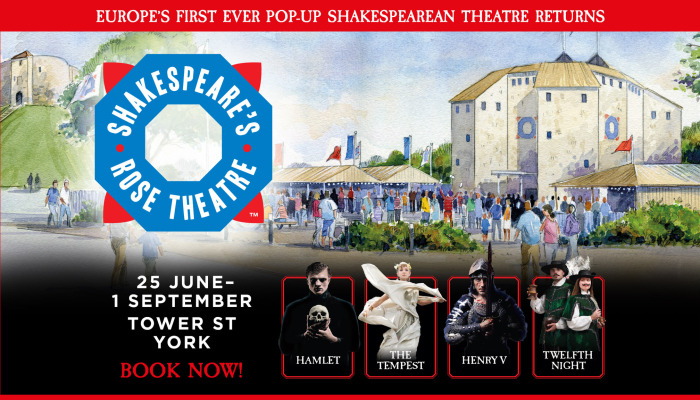 Inspired by the famous London Rose Playhouse built in 1587, SHAKESPEARE’S ROSE THEATRE will combine state-of-the-art scaffolding technology, corrugated iron and timber with the historic 13-sided design of a 16th century Shakespearean theatre. It will house an audience of 950, with 600 seated on three tiered balconies around an open-roofed courtyard, and standing room for 350 ‘groundlings’. Productions are suitable for those aged 10 and above, at parent/guardian’s discretion. Children under the age of 13 must be accompanied by an adult. Babes in arms will not be permitted in the theatre. All patrons must be in possession of a ticket.